Item #TCM-PAT-1-2 Texas Chainsaw Massacre Patches $5.95 ea. In Stock These officially licensed Texas Chainsaw Massacre sew on patches are full color and come on a backer card & sealed in a plastic sleeve, your choices are square poster art that is 3 3/4" tall X 3" wide or Leatherface running with chainsaw that is 4" in diameter. Item #DOTD-PAT-1 Dawn of the Dead Patch $5.95 ea. In Stock Officially licensed Dawn of the Dead sew on full color patches are near mint on a backercard and sealed in a plastic sleeve this patch is 4" tall X 3 3/4" wide. Item #ZOM-PAT-1 Zombie Movie Patch $5.95 ea. In Stock This officially licensed Zombie movie patch is also full color, sew on and is about 4" tall X 3" wide, comes in a plastic sleeve on a backer card. 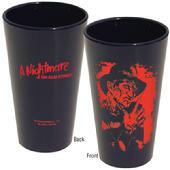 Item #08402 Nightmare on Elm Street-Freddy Scribbles Pint Glass SOLD OUT These new Nightmare on Elm St. Freddy Krueger scribbles pint glasses are near mint never been used, no cracks or chips each glass is 16 oz. and about 6 1/2" tall has Freddy on the front with different phrases, like 1, 2 Freddy`s coming for you, 3, 4 lock the doors etc. and on the back a Nightmare on Elm Street log officially licensed. 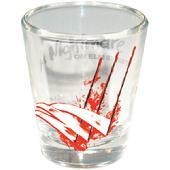 Item #08401 Nightmare on Elm Street-Scratches Shot Glass SOLD OUT These new Nightmare on Elm St. shot glasses have never been used, no cracks or chips in them officially licensed, on the front is Freddy`s glove blades "cutting" through the glass in full color with blood, on the back the Nightmare on Elm Street logo in black. Item #08404 Friday the 13th. Jason Hockey Mask Pint Glass $9.95 ea. In Stock This new Friday the 13th- Jason Hockey mask pint glass is near mint un-used no cracks or chips, has the iconic Jason Vorhees "hockey" mask on the front, with in blood red the Friday the 13th. logo on the back each glass is about 6 1/2" tall, and holds 16 oz. 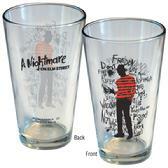 item #08403 Nightmare on Elm Street-Freddy Portrait Colored Pint Glass $9.95 ea. In Stock This new Nightmare on Elm St. Freddy portrait pint glass is near mint has never been used, has no chips or cracks, each glass is about 6 1/2" tall and holds 16 oz., on the front has in red is a portrait of Freddy on the back the Nightmare on Elm St. logo in blood red. 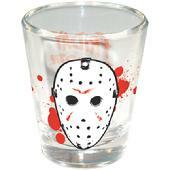 Item #08407 Friday the 13th.-Jason Hockey Mask Shot Glass $6.95 ea. In Stock This new Friday the 13th. Jason Hockey mask shot glass has the iconic hockey mask on the front and a Friday the 13th. logo on the back in blood red, officially licensed, shot glass is in near mint condition has no cracks or chips and has never been used. 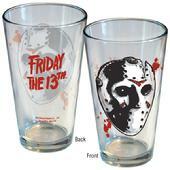 Item #08406 Friday the 13th.-Jason Silhouette Colored Pint Glass $9.95 ea. In Stock This new black Friday the 13th.- Jason silhouette pint glass is near mint has never been used, has no chips or cracks, each glass is about 6 1/2" tall and holds 16 oz., on the front has in red Jason wearing his hockey mask and on the back one of his victims he is stalking both front and back is in blood red. Item #08399 ICUP-Friday the 13th.- The Final Chapter Poster Can Cooler $5.95 ea. In Stock This Friday the 13th.-The Final Chapter poster can cooler is near mint and comes with a header card insert, image is the same on both sides, a great way to keep any canned beverage cold, full color and officially licensed. Item #08408 ICUP-A Nightmare on Elm St.-Freddy`s Dead Poster Can Cooler $5.95 ea. In Stock This Nightmare on Elm St. Freddy`s Dead can cooler is near mint and comes with a header card insert, image is the same on both sides, a great way to keep any canned beverage cold, full color and officially licensed. Item #TCM-ST-1-2 Original Texas Chainsaw Massacre Stickers $3.95 ea. In Stock Officially licensed Texas Chainsaw Massacre stickers your choices are can you survive poster art with Leatherface that is 5" tall X 3 1/2" wide, or the square one with eyes and the logo that is 4" X 4" only have a few of each.